Admire aerial views of Fremantle from above on a 15-minute helicopter tour. This historical port city, just south of Perth across the Swan River, is a popular local destination due to its bustling café scene and waterfront restaurants. Fly along the southern suburbs and coastline to look out at the Indian Ocean and white-sand beaches. Flights depart between 10am and 4pm. Please include your preferred flight time along with each individual passenger's weight at the time of booking. The closest available time will be allocated. You must call the local operator 24-48 hours prior to travel to reconfirm the exact departure details. All contact details will be advised upon confirmation. 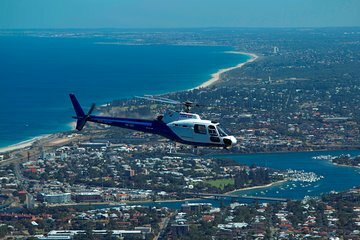 Your air tour by comfortable jet helicopter begins as you rise into the air, taking in bird’s-eye views of Fremantle’s historical buildings, busy port and restaurant-lined waterfront, which sit on the south side of the Swan River, just across from Perth’s upscale southern suburbs. Look down on the Western Australian shoreline, and admire beautiful views of the white-sand beaches against the turquoise water.